Japanese Episode 010: "Fushigidane's Hidden Village"
American Episode 110: "Bulbasaur and the Hidden Village"
Satoshi-tachi are lost on their way to Kuchiba City! As they try to figure out where to go, a wild Nazonokusa appears. Kasumi decides to catch it, but a Fushigidane steps in and prevents the pokemon's capture before running off itself. Later, the gang is forced to cross a dilapidated bridge in order to proceed. The bridge breaks, causing Takeshi to be thrown into the nearby river. After pulling themselves up, Satoshi and Kasumi search the area for their friend. Instead, they end up getting themselves falling for a number of traps to keep intruders away. The two are eventually saved by Takeshi, who explains how he was rescued by a young girl named Midori. Midori runs a secret village nearby that takes care of sick and abandoned pokemon, and the Fushigidane they had run into earlier just happens to be the defender of that village. Suddenly, the Rocket-Dan appear and try to kidnap all the injured pokemon! Fushigidane is able to fend the trio off, protecting the village's pokemon in the process. After seeing how well Satoshi worked with Fushigidane in battle, Midori decides that the grass pokemon should go with Satoshi on his journey. Satoshi accepts Midori's offer, but Fushigidane requests a battle from the young trainer in order to earn the right to become its trainer. Satoshi's Pikachu is able to weaken Fushigidane enough to allow its trainer to capture it, allowing Satoshi to add another member to his team! With a new friend by his side, Satoshi leaves Midori and her village and resumes his journey to Kuchiba City. This episode was so-so, I guess. I mean, the whole idea that a village (which consists of only one house, mind you) being protected by one Fushigidane is kind of interesting, I guess. But there were a lot of things that made this episode my least favorite of the three "Satoshi gets a Red/Green starter pokemon" stories. The Rocket-Dan repeating their giant hose scheme from three episodes ago is a bit absurd, as was that ridiculously overdramatic "Kasumi tearing up in front of Nazonokusa" scene. But I guess the thing that kind of ruined the episode for me was that it just didn't hold my interest for whatever reason. The Satoshi and Kasumi getting separated from Takeshi parts were sort of amusing, but that's really about it. It's also really weird to see Takeshi actually be embarrassed about showing his affection for the character-of-the-day. Who could have ever predicted that Takeshi would become the exact opposite of the shy and timid guy we see in this very episode? Going back and looking at older episodes can be weird sometimes. The dub has a paint edit and a number of weird script changes, but other than that it's pretty standard as far as edits go. I think this is the episode that Eric Stuart takes over as James' voice actor, so there's that, too. I think Eric Stuart did a pretty good job of voicing the character at first, but as the years go by, we'll see the voice gradually devolve into this extremely campy "makes LittleKuriboh's Pegasus voice seem serious in comparison" thing. Good thing we have quite a while before that happens, I guess. There are a bunch of weird, pointless script changes in this one. Misty: "Ash! You have to pull us back up! It's our only chance!" Misty: "Yes you will! Just pull as hard as you can!" Originally, Satoshi complained about how Kasumi was too heavy to pull up, prompting Kasumi to yell at him for implying that she's fat. I have no idea why they'd change this for the dub. Later, when Ash imagines what could have happened to Brock, he guesses that he was kidnapped by pirates with wooden legs. In the Japanese version, however, Satoshi guesses that he was picked up by an old hag who was cleaning the river. Then, when Takeshi appears and tells everyone that he was saved by a beautiful young lady, Satoshi remarks that being rescued by a pretty girl is a lot better than being saved by some old hag. Again, I have no idea why this was changed. Maybe 4Kids thought that pirates are cooler than old women? The flying (baseball?) stadium the Rocket-Dan are floating on has banners with various slogans advertising cheap concessions and special sales written out in Japanese. Of course, all of this writing was erased for the dub. I guess a question that one could ask is why the Rocket-Dan appeared on a flying stadium in the first place. I mean, it seems kind of random, doesn't it? Well, I have a feeling that it was done because of this following reference. 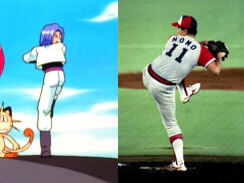 Right before the tornado created by Satoshi's Pigeon hits the Rocket-Dan, Kojirou strikes a baseball pitcher's pose and, in the Japanese version, yells out "Tornado!" Then, when the wind comes and throws everyone around, Kojirou says that the wind storm is just like Nomo Hideo. For those of you who don't know, Nomo Hideo is a Major League Baseball pitcher whose nickname was "Tornado" due to the unique way that he would wind up for a pitch. This prompts Musashi to exclaim that the tornado they're being sucked up by isn't the same "Tornado" that Kojirou's talking about. In the dub, this reference isn't made at all - instead, everyone just sort of grunts as the tornado carries them away. I guess they thought that little kids wouldn't get who Nomo Hideo is (I certainly didn't know who he was until I looked him up), but that seems kind of odd considering the number of references 4Kids inserts into later episodes that probably go right over their audience's heads.